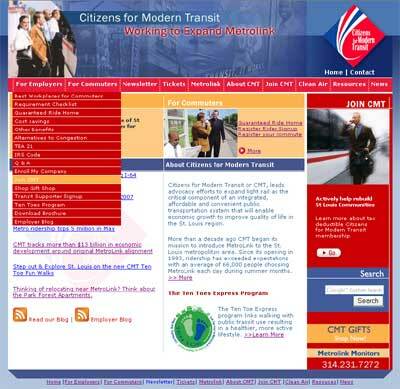 We launched a new web site for St Louis based Citizen of Modern Transit (CMT) about a year ago. Since that time the site has grown to such an extent that the original navigational structure was not opperating efficiently. As with all of our sites, we always design and develop so that if changes are need further down the line they can be easily accomodated and improving the navigation of the CMT site was no exception. We implement two major chnages to the site to facilitate the user experience The first was the addition of drop down menus enabling vistors to see at a glance the menu choices for each category. The second was the addition of a Google custom search. …another great free widget by Google. The custom search can be configure to search and return results from the entire world side web, a selection of site or just one site… our choice in this case. The non profit status of CMT also meant that the search results could be displayed without ads. Google provides all the code so the search function can be easily intergrated into the look feel of any web site.